NAKHON CHAI SI, THAILAND, 3 SEPTEMBER 2017 – Beautiful weather, wonderful circuit, optimum off-road section welcomed the 2017 FIM Asia SuperMoto Championship race day with grace. 17 riders from 13 countries prepared the morning with full of focus to win the top three podium race. The morning began with a free practice round where riders took the circuit as though it was a real race, putting their best foot forward, but still kept their little tricks for the main show at 12:00PM. Top three spots during the practice session were dominated by top three contenders namely United Kingdom’s Lewis Cornish, returning champion Thailand’s Trakarn Thangthong and 2016 champion Malaysia’s Muhd Habibullah. The competition to train amongst the trio created a fantastic ambience when full concentration is in place to overtake and shine for the official free practice result. In the end, it was Lewis who stole the top practice slot with the best time of 1:14.594, followed by Trakarn and Habibullah at 1:15.565 and 1:17.019 respectively. Moto 1 started with the sun shining directly above the riders on their respective grid. Sweats and anxiety to compete were spotted on their faces. Pole position Lewis Cornish stole the holeshot but was followed tightly by all riders as the race started with a straight tarmac road instead of the diversion to the first turn into the off-road section. The most awaited corner, a tight hairpin turn immediately after a table top has once again proven to be a disadvantage, as riders rushed into the tight turn, changing position between the remaining riders. With Lewis speeding through the empty circuit, Malaysia’s Muhd Habibullah and Thailand’s Trakarn Thangthong pursued the front-runner tightly. Just after a few laps, Lewis was two seconds away from the duo, and the furious battle turned to Habibullah and Trakarn, leaving all rooms for Lewis to continue his lead. The top three positioning continued until five minutes before the end of Moto 1 until Habibullah lost his pace and Trakarn overtook the second seed. With inadequate time to steal the second spot, Habibullah concluded third in Moto 1. Lewis leads Moto 1 with a total time of 22:236.002, followed by Trakarn and Habibullah at 22:42.962 and 23:14.056 respectively. Indonesia’s Farhan Hendro stunned the audiences with an outstanding performance in this race despite a mechanical issues in Friday’s Free Practice and Saturday’s Qualifying round. However, Farhan’s race on the track was not pure without some battle for his position. Japan’s Naoto Takayama and Russia’s Artem Teslenko tailed the Indonesian rider tightly, but Farhan managed to further the gap with a full throttle on the straights and exact precision over the whoops and table top. Farhan was tenth on the grid for Moto 1, but completed in the sixth place with a total time of 23:55.446. Similarly to Farhan, Philippines’ Kenneth San Andres showed significant improvements in his performance on the track. Being a lapper during the Qualifying burned his passion to uplift his status, putting his best foot forward for Moto 1. Kenneth concluded with 17 laps and a total time of 23:10.666. The second Malaysia’s ace Khairi Zakaria started the race threatened by Dutchman Marcel Van Drunen. The duo competed and exchanged position multiple times until Khairi lost his pace at the first off-road section, giving Marcel the opportunity to steal the spot and widen the gap. Another unfortunate incident stumbled upon Japan Takashi Sasaki when a machine malfunction took his chance to compete. The Japanese were seen riding his bike leaving the track on the seventh by a large disappointment. The second race witnessed high intensity on the track as Lewis stole the show with the second holeshot of the day. His familiarity of the circuit over the two days of practices were at the tips of his finger, riding through the track ahead of all riders. Lewis comfortably rode his way to victory, winning at least five seconds ahead of the first runner-up, Thailand’s Trakarn Thangthong. “It was a very technical track. Most of us were using slick tyres to race the track. With the triple dirt section, it feels more like a motocross track instead. I made multiple mistakes in Moto 1 but reduced it in Moto 2. I believe Trakarn and Habibullah made mistakes as well, which gave me an advantage to the race,” said Lewis. “I was fortunate when Habibullah hit on a hole at the third dirt section. That was when I passed him. He grew so much since our last faced off in 2015. I enjoyed riding with all the riders, and hopefully, I can perform better in Indonesia,” said Trakarn. Lewis and Trakarn rode smoothly as the Habibullah and Marcel pursued a battle for the final podium spot, blocking any other riders from moving forward in their position. The goose chase between the Malaysian and Dutchman continued with multiple high risk overtakes on tight corners. Neither was giving up for the third podium spot. The dirt section was always the game changer for the duo, deciding on who leads upon exiting the off-road sections. Lap after lap of their battle soon became fan favourite. It was until the final two laps during the race, Habibullah mistakenly took a detour off course, receiving a penalty that immediately drops his dreams for a podium, a blow to his team and his confidence for the season. “My front and rear brake malfunctioned, and I lost control of my bike. This makes it even harder for me to maintain my pace, especially on this track. Alongside with Marcel eyeing on me, I tried my fullest to ensure that the best performance is delivered in this condition,” said Habibullah. Habibullah landed the sixth spot in Moto 2, clocking a total time of 24:20.495. However, the Malaysia’s dream was not trashed when his counterpart, Khairi Zakaria, took a stunning turn. Khairi has attempted to close the gap with Marcel, but his efforts failed as he continues to make a mistake at the transition and off-road section. Khairi landed fourth in Moto 2, finishing nearly two seconds behind Marcel with a total time of 23:50.924. 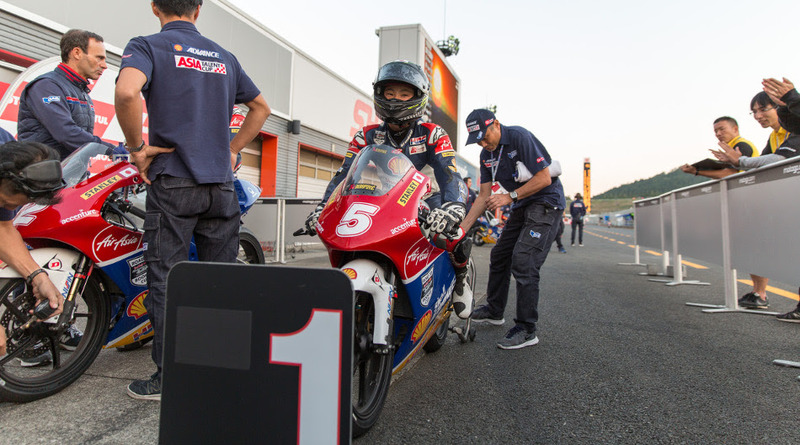 Instead, Japan’s Naoto Takayama outperformed on Moto 2, with controlled skills and speed that led him to complete the circuit in 24:07.549, landed him the fifth spot in the second race. His Japanese counterpart, Takashi Sasaki, who met with a machine malfunction in Moto 1 finished the course in Moto 2. However, it was a safe play on track instead of sliding at corners and speeding on the straight tarmacs. Newcomers Indonesia’s Farhan Hendro and Philippines’ Kenneth San Andres underperformed with a slower pace and less control on their bikes, giving them the final results of the seventh and eighth spot with a total time of 24:26.555 and 23:35.442 respectively. “It was a perfect and successful race. We would like to congratulate the Asia Supersports Group, FMSCT, all the partners and all the riders. The opening round of the season was exciting, and everything was in order. The track is probably one of the most challenging tracks in the season’s history, but all safety aspects were taken into consideration,” said Stephan P. Carapiet, FIM Asia Safety Officer. The 2017 FIM Asia SuperMoto Championship will commence in Jogjakarta, Indonesia on 7 and 8 October 2017. For more information, visit www.supermotoasia.com or watch the race live for f ree in HD on www.twenty3.tv powered by E-Plus Global Sdn Bhd. NAKHON CHAI SI, THAILAND, 2 SEPTEMBER 2017 – Gloomy Saturday morning at the renowned Thailand Circuit Motorsport Complex turned to be the main threat for riders on track. The uncertain weather created anxiety within riders as they braved through the toughest track developed for the championship. In addition to the heavy overnight downpour, the rutted off-road section increases the challenges with hard and uneven dirt, creating a fierce battle even for the best riders on track. Amidst the opening of the track for practice, riders and team mechanics seemed to faced complications with a slight delay in the entrance to the track. It was only five minutes after the announcement only the first rider appeared. United Kingdom’s Lewis Cornish #8 took the lead with full confidence in conquering the complicated circuit, showing excellent skills and performance that derives from his over ten-year experience on both Motocross and SuperMoto. Soon after his entrance, the second lap witnessed a boisterous brawl between the #8 and Dutchman Marcel Van Drunen #17. The duo put on a stunning performance despite being a free practice session. Neither made way or leaving any gap on the track, posing a brutal exchange in hope to utilise the knowledge as an advantage for the Qualifying round. “The off-road’s condition was different from yesterday. It was difficult, but hopefully, the dirt will dry up before the Qualifying,” said Lewis. Lewis topped the free practice with 1:21.767, followed by Marcel with 1:22.456. Another team battle was witnessed between the Malaysian top duo, 2016 champion Muhd Habibullah #1 and 2013 champion Khairy Zakaria #32. The #32 kept his eyes locked to Habibullah all the time but failed to maintain his pace. Khairy’s disappointment upon his return to the paddock showed a confident look that he will defeat the 2016 champion in Qualifying. “I am keeping a few tricks up my sleeve for Qualifying, and I will show the crowd and my rivals on my potential on track. My bike is in an optimum form, and hopefully, luck will lead me to the pole position later,” said Khairy. Khairy clocked the free practice at 1:27.501, over a second behind Habibullah that clocked at 1:25.274. Thailand’s ace, Trakarn Thangthong’s (#5) performance on track was a stunning show with stupendous power slides and stable jumps across the whoops. Without taking regard of other riders during the practice session, Trakarn surfed through the track elegantly, crossing lappers including Russia’s Artem Teslenko #97, Taiwan’s Lin Chin Pei #720 and Lee Wei #40, China’s Sun Tong #27 and Hong Kong’s Tsang Wai Kei #102. “I am sure that I am in my best condition after the practice round today. Coming in third in the practice round, I believe that I can perform and bring the first round trophy for the country,” said Trakarn. Trakarn finished the free practice clocking 1:23.079. Fighting for one of the six entry to SuperChrono had the riders put on the best opening show for the 2017 FIM Asia SuperMoto Championship. The Qualifying round that began at 2:30PM at the Thailand Circuit Motorsport Complex witnessed a change in the riders’ crave for the starting grid positioning tomorrow. The scorching sun returned briefly before the start of qualifying to dry the off-road section, creating a relatively easier track for the riders. While the Qualifying round does not require the riders to compete by the grid, Japan’s Takashi Sasaki #101 kicked-off the round with a tremendous performance on the track, taking advantage of the empty circuit in his attempt to secure the top spot for the race tomorrow. Shortly after, top riders Lewis Cornish, Trakarn Thangthong, Muhd Habibullah, Khairy Zakaria, Marcel Van Drunen, and wild card rider, Thailand’s Natthapat Suksan Watthana entered the track and stole the show. The battle between Lewis and Marcel was apparent that their rivalry was put on track even after the Free Practice. However, it was Lewis’ experience that aced the circuit as he blocked Marcel from leading the race. The blockage poses a threat for Marcel who ended up two seconds behind Lewis, which resulted in another graveyard battle with former champion Muhd Habibullah. With Lewis securing a spot for SuperChrono, Marcel and Muhd Habibullah battled out for the second and third spot. While the tracks’ condition has improved, the hairpin turn immediately after a table top jump seemed to be the toughest challenged even for the top riders. Malaysia’s Muhd Habibullah and fans’ favourite, Thailand’s Trakarn Thangthong, were troubled with almost slipping off-track during the tight turn, especially when the lappers were met at the corner. Both individuals with motocross experience did not put their best foot forward for the dirt section while trying to redeem their mistake with a full throttle on straight roads. Thailand’s wild card rider Natthapat Suksa Watthana shocked the audience with a favourable performance, landing him the final entry to SuperChrono. The Thailand rider faced multiple complicated mechanical issues during the free practice yesterday. 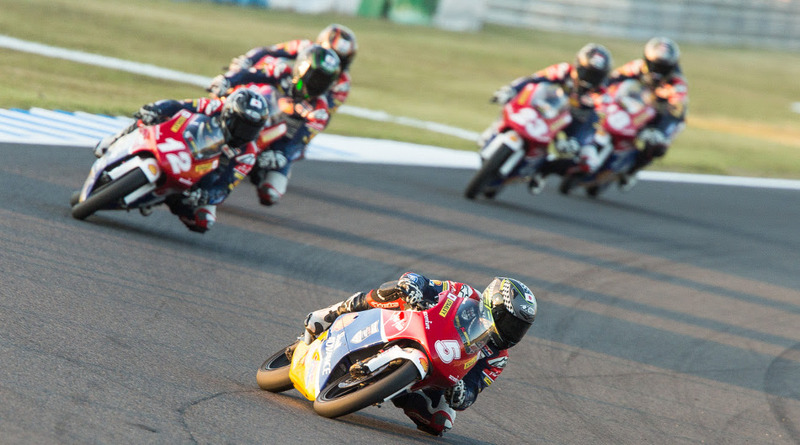 With all eyes on the Thai riders, the host country is likely to secure at least a spot on the podium tomorrow. However, it was a struggle for Indonesia’s Farhan Hendro #162 when a mechanical issue took a toll on the bike, showing him the way out of the track earlier than expected. Despite the downturn, Farhan still secured the tenth grid spot for Moto 1 tomorrow. Another eye opening rider, Philippines’ Kenneth San Andres wowed the spectators and rivals with an overwhelming performance. Steady riding across the circuit oppose his humble performance during Free Practice. Circuits were cleared from all riders other than the top six qualifiers, making space for full speed across the track. Six riders - Lewis Cornish, Muhd Habibullah, Marcel Van Drunen, Trakarn Thangthong, Khairi Zakaria and Natthapat Suksan Watthana, competes for the pole position for Moto 1. It was clear that Lewis overpowered the other riders and stole the pole position, clocking with the best time of 1:15.297. Habibullah, on the other hand, tried to fight with speed but his lack of experience and confidence in long tracks landed him second for the grid tomorrow. Malaysia’s Khairy Zakaria’s performance during SuperChrono was slightly disappointing when he held back at all three off-road sections, landing him the fifth grid position. The Thai duos Trakarn Thangthong and Natthapat Suksan Watthana puts on a stable race without much risk to secure the fourth and sixth grid positioning respectively. Moto 1 will commence on Sunday, 3 September 2017, from 12:00PM (+7:00 GMT). After a season that has seen some of the best GT racing anywhere in the world, the 2016 GT Asia Series will come to its dramatic conclusion later this week with the final two rounds of the championship contested over two 60-minute races at Shanghai International Circuit in China. There’s just nine-points separating the top two teams with 36-points on offer across the two races, and whilst rising young Italian stars Edoardo Liberati and Andrea Amici lead the championship in their stunning black Roger Dubuis Lamborghini Huracan GT3, local heroes Anthony Liu and Davide Rizzo have every chance of turning the tables at their home circuit. Across the 10-races that have so far made up the 2016 season, we’ve seen six different winning combinations, so should either of the top teams falter, there is no shortage of challengers who will take the fight into Thursday afternoon’s final race. The Series coming down to the wire is not unusual for GT Asia, but in season 2016, the number of drivers capable of claiming the crown has dramatically increased - 11-drivers still in mathematical contention. After a testing few weeks ahead of the conclusion to the 2016 Series, the final event has been forced to concede to a two-day, mid-week format, although nothing will change with the race length, the two final rounds contested across a 60-minute - compulsory pit stop - format, however unlike much of the current season, both races will be held on a single day, something which will have an impact on strategy with the title on the line. “We’re really looking forward to the final event of the season - the ‘GT Asia Series Shang Peng Race of Shanghai’”, Motorsport Asia CEO David Sonenscher admitted. “The depth of competition in the Series this year is incredible - the best in our six-year history - effectively every car in the field is capable of the podium which makes the result completely unpredictable and that also means there’s no guarantee of who will claim the title this year. Teams will hit the Shanghai circuit for the first time on Wednesday morning (19 October) at 9:00am for the first of two 90-minute practice sessions, the second coming at 11:30am, before the two 15-minute qualifying sessions set the grid for the two races on Thursday, and whilst qualifying is important, in season 2016 the pole-sitter has won only three of the ten rounds contested, so it’s by no means a guarantee of a podium finish..
During the August event the pace-setters were Audi, with Phoenix Racing Asia’s Alex Yoong, Marchy Lee and Shaun Thong consistently at the top of the timesheets. Sadly for Lee and Thong a technical issue sidelined them early in opening qualifying forcing two rear of field starts, the duo though working their way from the back to positions inside the top five. Should they carry on that impressive form, they could well surprise the points leaders. Bottom-line is that if you have the ability to watch this event unfold LIVE on FOX Sports Asia or Star TV, or LIVE online, make sure you do, these two races have the foundations to become the greatest GT Asia Series rounds ever contested..! If you can predict the race winners and ultimately the championship winners, you’d have to be in possession of a crystal ball because there is no guarantee that the two 60-minute races will provide a predictable result..
On points you could argue that the two FFF Racing Team by ACM Lamborghini drivers are in the box seat with their nine point championship lead, but that would be discounting some of the best teams in Asia. The local BBT team are strong in Shanghai, and they’ll be ruing some difficult strategy decisions last time out that saw them leave Shanghai’s tenth round with a nine-point Series deficit - they’re a sharp operation though, and aided by the resources and knowledge of Ferrari’s AF Corse, they will be throwing everything they have at Liu and Rizzo to go after the crown. That said, Marchy Lee and Shaun Thong and the three Bentley Team Absolute cars are all in contention for the crown, and all are having a strong finish to the season, so discount them at your peril..! In fantastic news for the category, Fox Sports Asia will broadcast both races live to millions of viewers throughout the Asian region as the action unfolds and for those that miss it with mid-week commitments, they will replay both races in full on the Sunday immediately following the event (check http://tv.foxsportsasia.com/ for scheduled times). In China, Star Sports will also broadcast both races live, whilst China’s popular online network LeTv will also host both races live, the network one of 27-online platforms that saw the fifth event of the season at Shanghai broadcast to more than 6.3-million viewers across China. The final will see GT Asia’s second visit to the 5.5-kilometre Grand Prix circuit this year, and the fourth in the six year history of the Series. During previous visits (2014-2015), the Series competed on the shorter ‘national’ circuit, but last time out in August, teams were treated to the full length 16-turn Formula One layout and the pace was impressive. Qualifying saw 11 cars covered by less than a second over a 2:05-minute lap, whilst the opening race saw three cars - all different marques - cross the line just two tenths of a second apart after 60-minutes of intense racing, and the Series finale should provide nothing less! In the previous three visits to Shanghai, wins have fallen in favour of Darryl O’Young (two wins), Keita Sawa (two wins) and Jonathan Venter (one win), whilst Anthony Liu and Davide Rizzo also have the impressive record of finishing on the podium in four of their six starts their to date, including two wins themselves. The GT Asia Series is sanctioned by the FIA as an International Series and is clearly recognised as the Region’s leading GT Championship. It is solely managed and promoted by Motorsport Asia Ltd and is backed by Shang Peng, Singha, Michelin, KW Automotive, Motul, Race Room, Panta, YOFC and Tunewear. The first race of the weekend in Japan for the riders competing in the 2016 Shell Advance Asia Talent Cup saw home rider Yuki Kunii take his second consecutive victory, doing so from pole in front of the Japanese fans. With the young riders in the Cup racing alongside the stars of MotoGP™ at Motegi as part of the Grand Prix of Japan, Kunii won an exciting race late on Saturday afternoon, to follow up on his win in Race 2 in China at the last round. 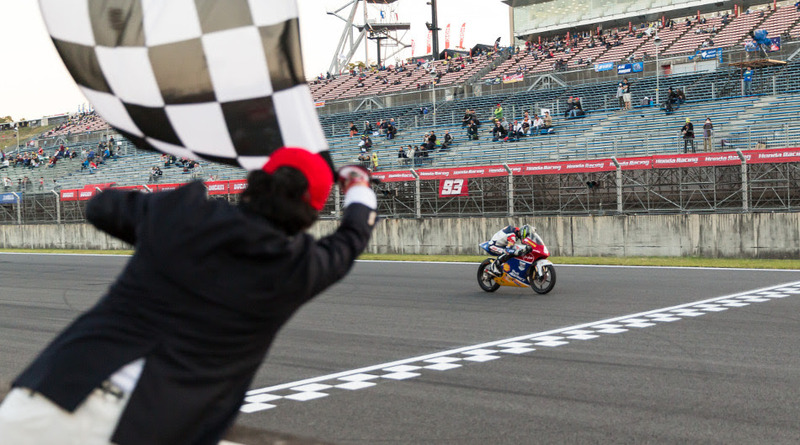 Having got away in pole position at the head of an all-Japanese front row, which also featured Ryusei Yamanaka and Kazuki Masaki, Kunii went on to win the 15-lap race around the superb 4.8km Twin Ring Motegi track in style. On the back of his excellent weekend in China Ai Ogura made a good start from fourth on the grid, with a large group running together at the front in the early laps. After much shuffling in the lead pack a group of five riders pulled away, including the Japanese quartet of Masaki, Kunii, Ogura and Yamanaka, who were joined by Indonesia’s Andi Izdihar. Eventually Kunii took control of the race to pull away and take maximum points, ahead of Masaki who finished in second place having got the better of Ogura on the last lap. Another close battle on the final lap saw Yamanaka beat Izdihar for fourth. In sixth place was standings leader Somkiat Chantra, whilst another rider in the championship fight, Gerry Salim, finished down in tenth. The results of Race 1 of the penultimate weekend of the 2016 Shell Advance Asia Talent Cup mean Chantra remains top of the standings with 140 points, Ogura sits second on 135 points, just ahead of Izdihar in third on 133 points. Also in the top six are Salim (126 points), Yamanaka (124 points) and race winner Kunii (119 points). Race 2 of the weekend takes place at 3.30pm local time on Sunday after the MotoGP™ race at the Grand Prix of the Japan. 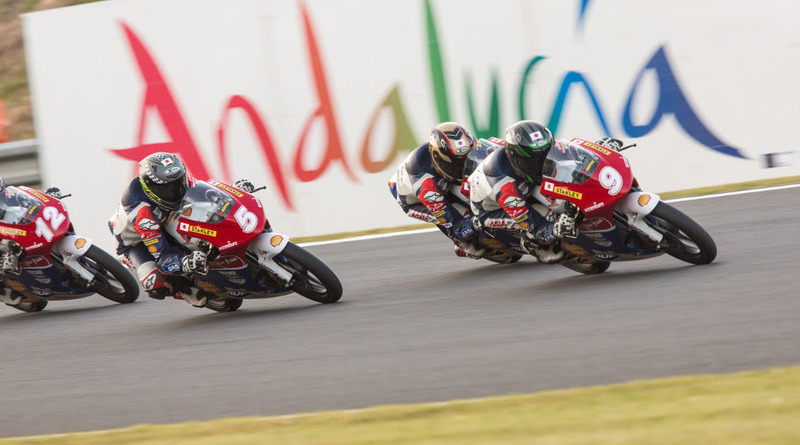 After that the Shell Advance Asia Talent Cup riders will reconvene for their final races of the season at Sepang over the Grand Prix of Malaysia weekend in two weeks time. Download our Media Flyer by clicking here. Download Race 1 and Championship Standings by clicking here. The 2016 GT Asia Series comes to it’s dramatic conclusion in Shanghai on 19-20 October with news that Shang Peng Gao Ke will be joining the Series as the official event title sponsor - the event will now be known as the ‘GT Asia Series Shang Peng Race of Shanghai’. Shang Peng Gao Ke is a cross-border e-commerce marketing company and their involvement will allow thousands of Shang Peng associates to enjoy the drama and emotion of Asia’s leading GT championship, as six teams battle for the right to become the 2016 Series champions. Shang Peng associates will also have the opportunity to cheer on their very own team! For the Series final Craft-Bamboo Racing’s Frank Yu and Richard Lyons will wear the colours of Shang Peng on their #88 Porsche GT3 R, providing a great focal point for the fans, and thanks to a striking new livery, the car will be easy to identify and follow with its angular red and white theme that draws inspiration from the Shang Peng corporate colours. As title sponsor of this epic season finale, Shang Peng will enjoy fantastic brand exposure around the race track and grandstand sections. Shang Peng race queens will feature in the paddock, pit lane and on the grid where they will be sure to draw a crowd of both fans and media. A large hospitality tent will also be present to allow visitors to personally connect with Shang Peng and their drivers and collect Shang Peng team memorabilia. They can also get their photos taken with the official Shang Peng race queens as a reminder of what will be an outstanding conclusion to the 2016 season. And in fantastic news for the category, Fox Sports Asia will broadcast both races live to millions of viewers throughout the Asian region as the races unfold, and for those that miss it with mid-week commitments, they will replay both races in full on the Sunday immediately following the event (check http://tv.foxsportsasia.com/ for scheduled times). In China, Star Sports will also broadcast both races live, whilst China’s popular online network LeTv will also host both races live, the network one of 27-online platforms that saw the fifth event of the season at Shanghai (19-21 August) broadcast to more than 6.3-million viewers across China. MALANG, INDONESIA, 9 OCTOBER 2016 – Torrential rain. Buckets of it. Flash floods on track. Those would usually mean a death knell to thrilling racing as riders cut risks. Racing bogs down to a mere procession, but not if it is the FIM Asia Supermoto Championship races. Held at the Kanjuruhan Stadium in the suburbs of Malang City, Indonesia’s first international supermoto event ended on an exhilarating note. As per the usual weather report over the weekend, the day started under intense sunlight and high humidity. Thousands of spectators had thronged to the trackside by early morning, lining every gap in the barricades. There was a particularly high concentration of fans surrounding the offroad section, prompting Race Direction to open it for racing, starting with the support races, despite the dark volcanic being still soppy and certain sections were waterlogged. The fans had no doubt wanted to witness some high-flying action. The support class racers went out and were promptly bogged down, turning the races into an enduro. A couple of FIM Asia Supermoto riders went out to test the dirt and found that it was impractical to race there. If the lighter KLX150s had found the going tough, what more the heavier 450cc supermotos. The section consequently remained unused. Part of the regulation stated that in an event of rain and if the off-road section is deemed muddy, the off-road section shall be closed as the mud will get onto the tarmac. Rain started to fall just as Race 1 got under. The front row riders charged into the Turn One neck-to-neck. As they excited the corner, there was a blur of a bike going sideways followed by a 3-bike pile-up. “Andy (McLiesh) came up on the inside and I was squeezed into Andre (Sondakh). We tangled and all three of us hit the ground,” said Mohd. Al-Amirul (better known as Gaban). Emerging from the fracas was Asian championship leader, Muhd. Habibullah (better known as Gabit), followed by Lewis Cornish and Richard Dibben. Gabit started pushing immediately and opened up a handy lead, leaving his other two rivals to battle it out. Cornish and Dibben passed and re-passed each other numerous times, but it was the latter who prevailed. Gabit had settled into his rhythm by this point, circulating steadily. Cleared of Cornish, Dibben started to put the hammer down, gradually closing the gap to Gabit, but the plucky Malaysian kept the gap at 1-second. The high pace of the leaders brought them into contact with backmarkers just five laps later. Engrossed in their own battle for track position, Gabit couldn’t find a safe passage through. Dibben saw his chance and bore down on his hapless prey. Dibben outbraked Gabit into the last turn. Gabit held on and both riders exited side-by-side, almost on top of one another. A huge roar went up around the track. Both riders gunned their throttles at the exact time, but Gabit’s rear squirmed and slid sideways, costing him the all-important drive onto the long front straight. Still, Gabit kept Dibben in check like a prey turned hunter. The rain now picked up and turned the front straight into a yellow-coloured river. “We had only dry weather tyres to play with. The closest to rain tyres were intermediates. I could keep up when entering the corners and but kept losing drive coming out,” said Gabit. Gabit came closest to retaking the lead when the pair again ran into a group of three backmarkers. Oblivious to the faster riders, the leading rider of the group closed the door going into a righthander. Dibben almost slammed into the rider, while Gabit split the two other riders and managed to show his front wheel next to Dibben. From then on Gabit kept the pressure up but the 20-minutes + 2 laps race was up. Dibben pipped Gabit to the line, and Gaban finished in a lonely 3rd. The intense action was not only limited to the front runners. Competition was so fierce a rider snagged one of the straw bags lining the track, strewing its contents. Another rider rode up a tyre barrier but his reflexes helped him to bunny hop off it. Spectators were similarly wowed by watching the bikes slip, slide, squirm throughout the race. Although the rain subsided slightly by Race 2, it was still heavy by any measure. The charge down into Turn One was a heart-stopping, all-or-nothing affair, but it was Gaban who held his nerve and claimed the holeshot. In his typical style, Gaban gave it everything, pulling away from Gabit rapidly, followed by the usual suspects Cornish and Dibben. Just at the moment when it looked like he was going to dominate flag-to-flag, his rear tyre almost went under him, but it regained traction and almost highsided. “It’s then that I decided to keep a steady pace and not throw it down the road. There’s always another day to fight for the championship,” he revealed. Dibben and Cornish did not require an invitation to hit the front, and resumed their race-long close-quarters battle to the end. Dibben again edged another racer at the line to claim his second victory. Gabit started to slow as his tyre woe increased. He eventually finished fourth. The race was witnessed by officials from His Excellency, the Regend of Malang’s office; Tony Nagamaiah, General Manager of Malaysia Major Events, Tourism Malaysia; and some 30,000 spectators. After the closest season in GT Asia Series history, the 2016 championship comes to it’s conclusion at Shanghai International Circuit on 19-20 October and Fox Sports Asia - who have been instrumental in building the profile of the category over the last six months - have pulled out all stops to cover every minute of the action from the final two rounds of the year. 13-drivers are still in the Series with a mathematical chance of championship victory heading to the Chinese event, which due to a last-minute change forced upon Motorsport Asia by an external event promoter has seen the date change to mid-week, with the final now scheduled for Wednesday 19 October and Thursday 20 October. As a result Fox Sports Asia (and Star Sports China), have committed to cover both final races LIVE, whilst Fox Sports will also replay both races on Sunday 23 October for those who were unable to catch all the live action as it unfolded. In addition, China’s popular online network LeTv will also host both races live, the network one of 27-online platforms that saw the fifth event of the season at Shanghai (19-21 August) broadcast to more than 6.3-million viewers across China. “I have to say, this is fantastic news, and thanks to Fox International Channels for supporting us with the final after what has been a particularly challenging month for the category, with promoters failing to deliver on promises,” Motorsport Asia Limited CEO David Sonenscher admitted. “There’s no question that the 2016 season has been the closest on record. Six different teams in four different marques - five different models - have taken wins in the ten races so far, whilst the most recent round saw 11 cars separated by less than a second in qualifying, and two tenths of a second covered three marques at the line after 60-minutes of intense competition..! Do you know that there were drivers from more than 20 different countries racing in the 2018/19 Asian Le Mans Series? We asked a few of them to say hi in their own language! Photo - We can’t wait to see the Asian Le Mans Series teams take on the mighty 24 Heures du Mans! We can’t wait to see the Asian Le Mans Series teams take on the mighty 24 Heures du Mans! This year’s 24 Hours of Le Mans on 15-16 June is a landmark event as the grand finale of the FIA World Endurance Championship, bringing the 2018-19 Super Season to a close (FIA WEC). The 2019 24 Hours of Le Mans Selection Committee received a record 75 applications from teams eager to take part in this year’s milestone race, where the world champions will be crowned. The quality and diversity of this year’s line-up certainly promises to keep the Le Mans 24 Hours legend alive, while heralding a new era with the race as the climax of the World Endurance Championship. And there is a host of new features yet to be unveiled ! RDV les 15 et 16 juin 2019 ! Eight teams that raced in the 2018/19 Asian Le Mans Series have received an entry! Video - A night to celebrate the 2018/19 Asian Le Mans Series Champions! A night to celebrate the 2018/19 Asian Le Mans Series Champions! Video - Thank you Michelin Motorsport for your support in the 2018/19 Asian Le Mans Series! Thank you Michelin Motorsport for your support in the 2018/19 Asian Le Mans Series! Photo - A night of celebrating our Champions! A night of celebrating our Champions! Hear from our GT class pole sitter, Dries Vanthoor Racing - who has also claimed the first ever pole for the 2019 evolution of the Audi Sport R8 LMS GT3!! Well done to the Chinese TianShi Racing Team ! Video - Miss qualifying? You can catch up on all of the highlights now! Miss qualifying? You can catch up on all of the highlights now! Video - Missed qualifying? You can catch up on all of the highlights now! Missed qualifying? You can catch up on all of the highlights now! 4H of Sepang Qualifying has finished at Sepang Circuit! Don't forget we go live at 15:15 today for the final qualifying sessions of the 2018/19 Asian Le Mans Series!